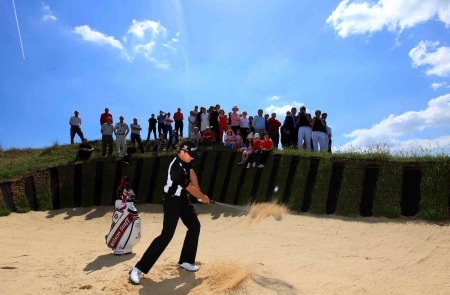 Padraig Harrington declares open the Sarazen bunker at Prince’s by playing out of it with his Wilson FG Tour wedge. Credit: Getty Images.It was hardly the kind of fare that will have struck fear in the hearts of his US Open rivals but at least he’s around for the weekend. Perhaps the most significant thing about Padraig Harrington’s nail-biting, survival after a two over 72 at TPC Southwind in the FedEx St Jude Classic is that his luck finally appears to have changed. He sat the wrong side of the cut line for most of the evening following a final hole visit to water at the 18th for a closing bogey - the fourth of a round in which he hit just three fairways and only eight greens. But after a year in which he has been disqualified, accused of teeing up in front of the markers and suffered neck, knee and hamstring injuries that have cost him dear, another two days in Memphis smells like victory. His statistics in the second round in Tennessee were those of a man destined to miss the cut at Congressional next week. But at least Harrington has another two rounds to find some semblance of scoring form before heading to Maryland. He will have been relieved to have told his pilots to shut off the engines in his 13-seat private jet, having been forced to wait around until just a few minutes before the end of play to see if he had made the two over par cut. Tied for 70th, he’s 11 strokes behind Sweden’s Robert Karlsson, who holds a two stroke lead over former US Walker Cup player Colt Knost on nine under par. Second round of two over par 72 left Padraig just making a very tight cut line with the field well bunched aside from the leader, Robert Karlsson who is nine under par. After a terrible start where he was three over par after seven holes, Padraig steadied the ship to play nice golf with two birdies recorded before a dropped shot at the tough par four last where he found water left him sweating for the afternoon. They could be two invaluable rounds over the weekend before next weeks US Open! Harrington is badly in need of some on-course practice this week. He shot 78 in the second round of The Players on May 13 to miss his third of the year - that’s four weeks ago for those counting. Forced to skip the BMW PGA at Wentworth two weeks ago, he says he’s physically fit but his long game is nowhere near sharp enough just yet to make him a dangerman at Congressional, despite a couple of rounds at Prince’s and Royal St George’s recently. In practice I have been pulling a few shots, which seems to be coming from my swing path being too much to the left. I have had this a few times during my career - the funny thing about it is that I actually strike the ball very well but it just starts left. It is something that I know how to fix, I just wish I had another few days to sort it out. That said when I think back to the times over my career when I have hit the ball like this, I have sometimes actually done quite well. So far, he’s simply done well to make the cut.